The first step in purchase price allocation, or PPA, is to determine the purchase price. Also known as the transaction price/value, this is the price paid for the equity of a company and is calculated as shown to the right. 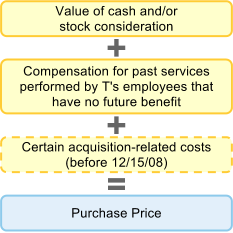 After December 15, 2008, acquisition-related costs are no longer included in the purchase price. Instead, the acquirer expenses these charges as incurred and the services received, while debt and equity financing fees continue to receive the same accounting treatment described above. Restructuring costs are not considered part of the purchase price under both FAS 141 and 141r. Payments to Target's employees for services performed in the past which have no future benefit are added to the purchase price because they are considered assumed liabilities. Examples include severance payments to Target's former managers and stock options that vest upon a change of control. We cover this topic in far more detail in the next lesson. 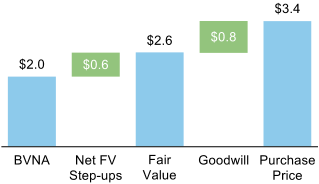 An acquirer allocates the purchase price to the assets acquired and liabilities assumed at fair value (FV) on the acquisition date (the first green bar in the chart to the left). Normally, the purchase price exceeds the FV of these assets and liabilities, resulting in goodwill (the second green bar in the chart to the left). Why would anyone pay more for something than it is supposedly worth? Perhaps because the acquirer expects to create value through synergies or better management, giving the target's sellers leverage to demand a premium for their business. Definition: The book value of net assets, or BVNA, is simply the difference between assets and liabilities recorded on the balance sheet. Recalling the fundamental accounting equation, A = L + SE, BVNA is simply shareholders' equity. Book values of assets and liabilities are often different from their FVs. In allocating the purchase price to these assets and liabilities, we step, or write, them up/down to reflect their FVs. Definition: The residual upon allocation of the purchase price to the fair values of assets acquired and liabilities assumed. Goodwill is an indefinite-lived intangible asset recorded on the acquirer's post-combination balance sheet that is not amortized but, rather, tested periodically for impairment. If the acquirer later writes down impaired goodwill, it is usually a sign that the business combination failed to meet expectations (e.g. Time Warner's troubled acquisition of AOL) and, consequently, implies overpayment for the acquired business and error in judgment by the acquirer. Definition: An intangible asset is recognized separately from goodwill if it either 1) arises from contractual or other legal rights, or 2) is separable, that is, capable of being divided from the acquired entity and sold, transferred, licensed, rented, exchanged, etc. Stock acquisition with a Section 338 election. Intangibles are not amortized for tax purposes in stock acquisitions absent a Section 338 election. Alpha acquires 100% of Tango in an asset acquisition for $125. Tango's book and tax balance sheets are identical and as shown in the spreadsheet below. How much goodwill will Alpha record on its balance sheet? Recall that in both asset and stock acquisitions, Tango's net assets are written up/down for book purposes and are recorded on Alpha's balance sheet at FV. However, for tax purposes, the write-ups/downs are treated differently depending on the type of acquisition. In an asset acquisition, as in Example 2.3, Tango's net assets are written up for both book and tax purposes. In a stock acquisition, on the other hand, Tango's net assets are written up for book purposes but not for tax purposes. Think about what effect differences between the book and tax balance sheets in a stock acquisition might have. In Example 2.3, we wrote up PP&E by $10 for book purposes. However, in a stock acquisition, there is no corresponding write-up for tax purposes. So, the pro forma book balance sheet records PP&E at its FV of $60, while the pro forma tax balance sheet records PP&E at its historical, or carryover, value of $50. The incremental depreciation of the write-up of PP&E for book purposes results in pre-tax income that is lower for book purposes than for tax purposes. Actual cash taxes in periods over which the PP&E write-up depreciates are, therefore, greater than book taxes. The deferred tax liability (DTL) recorded on the pro forma book balance sheet, in this case, represents Alpha's liability for the cash taxes that it must eventually pay the IRS in excess of the lower taxes it will report on its income statement for accounting purposes. The write-up of identifiable intangibles for book purposes but not for tax purposes also gives rise to a DTL due to the resulting incremental book amortization expense. In the context of the purchase price allocation, DTL = tax rate × (FV − tax basis). Consider Example A, except this time assume that Alpha acquires 100% of Tango's outstanding stock for $125. Alpha's tax rate is 30%. The DTL is calculated as 30% × ($60 − $50) + 30% × ($20 − $0) = $9. Note that writing up an asset is like writing down a liability, so the DTL's sign is negative for the purpose of computing goodwill. Now, suppose Alpha's pro forma GAAP pre-tax income is $46mm and its cash taxable income is $50mm in the first year after closing the acquisition of Tango. GAAP pre-tax income is lower than cash taxable income due to GAAP depreciation and amortization of incremental PP&E and identifiable intangibles—$10 and $20, respectively—created in the acquisition. How will Alpha record taxes in the first year? Definition: A business combination in which the total acquisition-date FV of the identifiable net assets acquired exceeds the FV of the consideration transferred plus any noncontrolling (minority) interest in the target. In a rare bargain purchase, the excess just defined must be immediately recognized by the acquirer in earnings as a gain that increases goodwill from a would-be negative value to zero after in accordance with FAS 141r. FAS 141 had required that any negative goodwill be allocated pro rata to the acquired assets, reducing their allocated FVs to zero. Any goodwill remaining following the pro rata allocation must then be recorded immediately as an extraordinary gain. However, before recognizing any such gain, the acquirer should check the PPA parameters for accuracy. IFRS 3 requires that all negative goodwill be expensed immediately, similar to FAS 141r. Consider Example A, except now assume that Alpha pays $70 for Tango rather than $125. The acquisition is completed on January 2, 2009. All PPA parameters were verified by Alpha. What journal entry will Alpha make at the acquisition date? The resulting goodwill on Alpha's post-combination balance sheet is zero (= $10 − $10).